Travel. Music. Sports. Fashion. Love. Food. Finance. Politics. 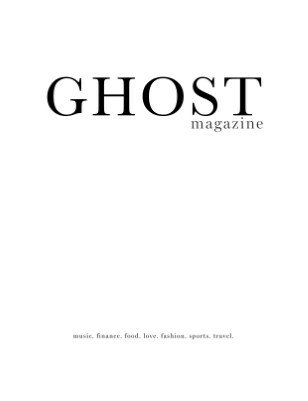 GHOST is a magazine for the person who wants to know a little bit about everything. A bunch of 20-somethings from NYC to Bombay to Lunahuana, Peru got together to share what has them excited right now. Get a look inside 33Hz drummer Brion Isaccs's world as he DJs around Manhattan, read up about this crazy cult in Michigan that changed baseball's history, find out how young people in finance are grappling with their wobbling industry, and leaf through some pretty gorgeous fashion. GHOST has got a little something for everyone!